Balboa Park Movie Night returns, featuring Tim Burton’s The Nightmare Before Christmas, and kid’s carnival activities! for making this event possible. Ride Muni or BART; bring a blanket or sit on the grass; bring a picnic or snack on some free popcorn donated by The Dark Horse Inn. ~VOLUNTEER: Please email info@eomm.org with your availability. The 2018 season finale of Sunday Streets, in the Excelsior! Enjoy car-free fun in the heart of the Excelsior from Avalon/Theresa to Geneva on Mission, with fun, FREE activities for the whole family to enjoy all along the way. Excelsior Outer Mission Merchants will be sponsoring an outdoor stage on Mission @ Seneca for local bands to perform throughout Sunday Streets event. Additional performances/activities will also display around the stage, highlighting local artists and merchants. Balboa Park Movie Night returns with a free showing of Raiders of the Lost Ark! Come see Indiana Jones in his first adventure! Ride Muni or BART; bring a blanket or sit on the grass; bring a picnic or snack on some free popcorn (donated by The Dark Horse Inn). The first of two Sunday Streets events in the Excelsior for 2018! Excelsior Outer Mission Merchants will be sponsoring an outdoor stage on Mission @ Seneca for local bands to perform throughout Sunday Streets event. Additional performances/activities will also run on the stage highlighting local artists and merchants. As an organization that serves local business owners and customers, EOMM is proud to support Small Business Saturday® this Nov 25. • On Nov 25, transform your store. Use provided American Express free merchandise and tote bags to promote. Excelsior Outer Mission Merchants encourages customers to shop local and dine local for Small Business Saturday. Participating merchants in the Geneva and Mission area will be giving away reusable shopping bags to those supporting businesses in our neighborhood. If you have questions or need assistance in promotion through social media, EOMM is here to help! Join us this Nov 25 to celebrate Small Business Saturday. Come to the 2017 Sunday Streets season finale on October 1st in the Excelsior! 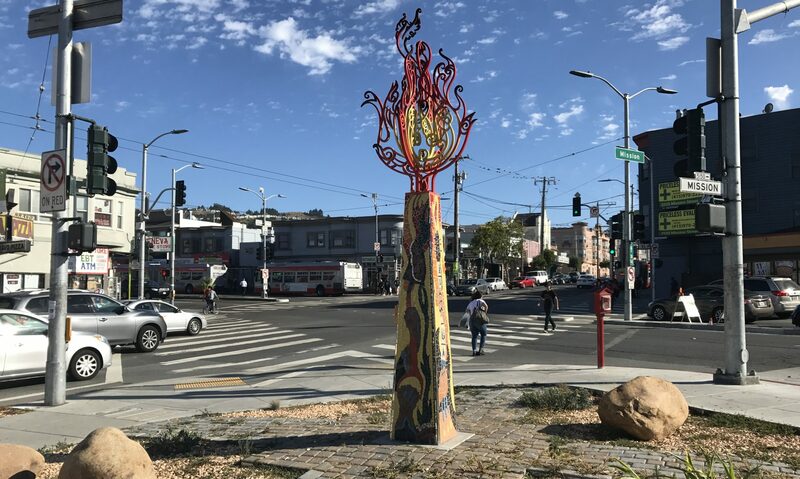 Enjoy car-free fun in the heart of the Excelsior from Avalon/Theresa to Geneva on Mission, with fun, FREE activities for the whole family to enjoy all along the way. Free community showing of Wreck it Ralph! 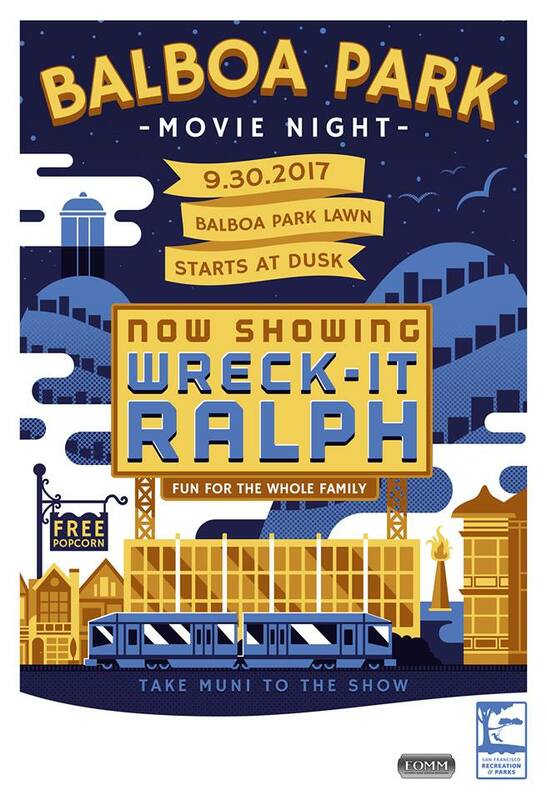 Bring the family for an outdoor movie night at Balboa Park! Ride Muni or BART; bring a blanket to sit on the grass; pack a picnic or snack on some free popcorn! Tickets $1 each or $10/dozen, available at the event only. Proceeds to benefit Balboa Park Movie Night. EOMM was awarded a 2015 Community Action Grant for a proposal to improve Pedestrian Safety in the Geneva-Mission area. The proposal, Safe Crossings, focuses on un-signalled crosswalks like the two highlighted in the photo above. Physical improvments to the crosswalks, an online list of affected areas and City of San Francisco projects affecting them as well as our own driver awareness campaign will kick off on June 15th, 2016.